200 years strong. And we're just starting. In 2018, Bloomington celebrated its bicentennial. With 200 years behind us, Mayor Hamilton is leading Bloomington into the future. In his first term, Mayor Hamilton has made building a future for Bloomington a top priority. From $200,000 first-time investments in Pre-K, to standing against "lunch shaming,” to introducing Youth Participatory Budgeting, Mayor Hamilton has fought for Bloomington's kids and youth. Under Mayor Hamilton, Bloomington became the first Community Development Financial Institution Friendly City to bring in new investment for minority-owned businesses, community facilities, and affordable housing. The Mill opened to entrepreneurial companies and innovators and companies like Cook, Bloom, Catalent, and Secretly Canadian continue to grow. Mayor Hamilton has led major investments in people and equipment across government: tripling investment in employee training, replacing worn-out fire and sanitation vehicles, protecting water quality, implementing deep transparency to city operations, and the police department earning its first-ever national accreditation. Bloomington is a city government that works. A person of proven ability, vision, and honesty, John Hamilton has earned my full support. I thank him for all he has done for our community, and look forward to continued progress. I’m a resident at Crawford Homes. For 3 years I struggled with homelessness. I slept on couches when I could and stayed at the interfaith shelter. This was a very difficult time for me – but getting an apartment at Crawford homes has changed my life. Today, I have a job serving others and I hope to get my bachelors degree in social work. I wouldn’t be here if people like John hadn’t worked together to build Crawford Homes. I’ve seen first hand what an impact John’s leadership has, and I think he’s an excellent mayor. "Even in a conservative state like Indiana, progressive mayors have been able to deliver for our residents, expanding opportunity and enhancing quality of life. Mayors across the state have seen John Hamilton's leadership in Bloomington set a positive example of bringing together inclusive government, progressive values, and real results." Read full endorsement press release here. John meeting with residents at Evergreen Village, Bloomington’s first Medicaid-accepting assisted living facility. Evergreen Village opened in the summer of 2018. Mayor Hamilton is leading Bloomington’s city government to new levels of excellence. Together with a diverse cabinet of outstanding department heads, he is fighting for Bloomington’s future of good jobs, affordable housing, and a high quality of life for all. Bloomington is a fantastic city in which to live. Much of what is truly special about Bloomington is what we have developed here over the past 200 years: good jobs, great neighborhoods, dozens of beautiful parks and trails, a vibrant and historic downtown, a thriving arts community, a world-class university, a safe community, our Farmers Markets, unique local businesses, and hundreds of dedicated nonprofits, among many wonderful features. The future of Bloomington depends on our ability to build on and further harness this natural energy and creativity to make our city even better, and for all people. To assure this bright future is open to everyone, Mayor Hamilton has worked proactively and creatively to address the challenges of job creation, affordable housing, and quality of life. Much of our work will build on the progress we’ve made since 2016 in these important areas.But more remains to be done to sustain our progress, to help all of our people fulfill their potential, and to assure the next generations of Bloomingtonians find even more opportunity to thrive. Mayor Hamilton is dedicated to making housing affordable for residents of all ages, abilities, and incomes. By collaborating with stakeholders, we’ve developed and preserved hundreds of units of new, long-term affordable housing. This unprecedented community effort--public, private, and nonprofit sectors working together--will help us reach our goal of every local family having a safe place to call home. With John’s leadership, over 600 bedrooms of affordable housing have been preserved or built in Bloomington, including B-Line Heights, Bloomington Cooperative Living, Urban Station, Park South, Crescent Village, and more. Promoting Housing-First to Fight Homelessness: As President of the Shalom Community Center Board, John helped attract $1 million in new federal funds to create Crawford Homes, an apartment complex that houses some of Bloomington’s most disadvantaged. As mayor, John continued his collaboration with Shalom to establish Crawford II and provide housing to persons experiencing chronic homelessness. John’s focus on a housing-first approach to address homelessness aligns with Shalom Center and Life Designs. Expanding Affordable Housing for Seniors: In 2018, Evergreen Village opened in Bloomington: the first Medicaid-accepting assisted living facility in town. This facility offers high-quality housing and care senior citizens, regardless of their income level. By including new housing strategies in the city’s Comprehensive Master Plan and zoning, we’ll assure long-term progress toward housing our community’s most vulnerable populations. Over past decades, like many midwestern cities, Bloomington lost a lot of traditional manufacturing jobs. Big companies like G.E., RCA/Thomson, Westinghouse, and Otis Elevator, which used to employ thousands of local workers at good pay, closed up or left. But many other local employers large and small have expanded. The creation of sustainable jobs, the shift to the new economy, and support for homegrown businesses must be priorities for Bloomington. John in front of The Mill, which opened in 2018. Developing the Downtown Trades Park: “The Mill” has opened in the Trades Park, providing 19,000 square feet of coworking space and serving as a business incubator. This space both provides resources for local start-ups and incentivizes larger businesses to expand to Bloomington. Collaborating to Establish CDFI Friendly Bloomington: This innovative approach to attract Community Development Financial Institutions (CDFIs) from our region and beyond aims to catalyze small business growth, expand affordable housing, and support community facilities in Bloomington and our area. Financing for the CDFI totals $14 million, with $4 million in local financing leveraging $10 million in outside financing. Bloomington is the first CDFI Friendly City in the country. The city of Bloomington recently led by example on fair wages, establishing minimum wage of $15/hour for city employees. Large employers are investing in Bloomington’s future: The new Regional Academic Health Center, our community’s largest-ever single project, is a $400 million investment partnership between IU and IU Health, retaining 3,000 jobs. Cook Group is investing $100 million into the shuttered GE plant and creating 500 new jobs. Catalent invested $1 billion in Bloomington’s economy, retaining 750 jobs, and soon announced a $125 million expansion to add 200 more jobs. Smaller and mid-sized companies are growing in Bloomington as well, including Bloom, Synopsys, Hanapin Marketing, Envisage, Cornerstone, Secretly Group, PTS Electronics, and many more. Ensuring Accessibility for All: John’s administration has overseen the installation of over 400 ADA-compliant accessibility ramps in Bloomington. Support for Public Education: A former school board member, John has been an avid supporter of public education, actively promoting two successful funding referendums and visiting many classrooms to connect kids and government. In 2018 The City of Bloomington for the first time ever committed $100,000 of general fund revenue to support pre-K childhood education for families and providers needing support (based on a recommendation from the Wage Growth Task Force). The allocations included the Compass Early Learning Center and the Community Foundation of Bloomington and Monroe County. Working together, the Parks and Recreation Department and Centerstone have established a groundbreaking summer jobs program helping hard-to-employ persons gain experience and find new jobs, as they take on public works projects. Public safety undergirds all quality of life, and the police and fire departments have risen to new levels of excellence: BPD earned its first ever national accreditation from the Commission on Accreditation for Law Enforcement Agencies (CALEA) and BFD has reduced medical emergency response times by 35%, improved its national safety rating, and tripled its professional training hours. Expanding Green Infrastructure: During John’s tenure, Bloomington has broken ground on the new Switchyard Park, the most ambitious public park project in our history, which will include 62 acres of a major amphitheater, a splash pad, a dog park, a skate park, public gardens, daylighted streams, ball fields, an indoor/outdoor pavillion, new trails, and more. Resident input informed what to include in the park, so it’s truly a place for everyone. In 2018, Bloomington parks received the Best in the Nation Award, and we have been a Tree City USA for 34 years running. Enacting Environmental Sustainability: Using his experience leading the Indiana Department of Environmental Management and the Bloomington Sustainability Commission, Mayor Hamilton has worked to ensure that Bloomington is a more sustainable city by installing over 4,500 solar panels across 30 city buildings, measuring and disclosing energy use of major buildings, and supporting greater innovation and use of alternative energy sources. John has helped expand Bloomington’s bike trails, improve our parks, and protect our green space and biodiversity. Bloomington has also collaborated with The Solar Indiana Renewable Energy Network (SIREN) to provide incentives and resources to residents who wish to add solar panels to their homes. John with Kathy and Chris Gutowsky, Bloomington residents who recently installed solar panels on their home. As mayor, John has empowered community members to have a detailed understanding of city activities and a stronger voice in the budget and other processes of their government. Tracking data and making that information publicly available can transform city work, through giving the public detailed performance measurements, holding the city accountable for its improvements and shortfalls, and empowering wider public input into a range of city actions. Mayor Hamilton has demonstrated a commitment to transparency that gives the public access to the city, online and in person. Opening the Doors to City Hall: John holds weekly open office appointments to meet with any city resident in his office at City Hall. He has also established the “Mayor at the Market” program, where John and department heads are regularly available to meet people and answer questions. Making Budgeting More Transparent with Activity-Based Budgeting: Bloomington has recently switched to activity-based budgeting, which means we outline and organize the entire budget around key activities rather than budget activities. For example, you'll hear what the city proposes to invest in fire prevention, or housing inspection, or arts promotion, or police patrols, as well as the affiliated total investment costs. And you’ll see the outcomes expected from each investment. This activity-based budgeting is central to helping all of us identify the real investments and choices we make in the budget and is far more transparent because it aligns funding with activities and outcomes. Establishing a City-Wide Survey: City government works for our residents, so finding out what our opinions are is important to align services and meet unmet needs. In 2017, John issued the first ever city-wide scientific survey better to understand what residents like, dislike, or want from their city government. The first survey established a baseline of views and opinions. The survey will be repeated every two years to identify trends and highlight opportunities and needs. Improving Online Accessibility: The Bloomington City website was named one of the Nation’s Top Ten for Digital Government in 2018. The B-Clear feature makes over 150 public data sets available and easy to access, increasing accessibility and transparency in our local government. What has John done to increase government transparency and accessibility? B-Clear on the city website offers more than 175 data sets sharing detailed information, providing the public with unprecedented searchable and usable up-to-date information. The first-ever city survey scientifically surveys residents’ views on a wide variety of issues and then shares the results with the public and benchmarks us against hundreds of other cities. It is repeated every two years. Annual budget and performance reports include specific goals and performance results of every city agency, detailing hundreds of specific, measurable goals and results for public review and analysis. At the Mayor’s direction, the police and fire departments now provide annual public reports on statistics measuring their performance and results. The police department is a national leader in an Open Data Initiative, sharing important metrics on police actions. The Mayor offers weekly open office hours, welcoming any member of the community to meet with him to discuss whatever is on their mind. A record number of public documents have been made available for public review. Youth Participatory Budgeting offers young people the opportunity to allocate city funds toward their jointly identified priorities. Won the 2018 Best of Indiana Award for Best Application Serving the Public (Local Government) for 2017 website redesign. The city publishes bi-weekly survey questions through Polco, an online public-engagement platform. Under John’s leadership, what has Bloomington done for affordable housing? With John’s leadership, Bloomington has added or preserved over 600 bedrooms of long-term affordable housing. These include homes for people from all walks of life, including B-Line Heights, Crawford II, Bloomington Cooperative Living, Evergreen Village, Urban Station, Park South, Crescent Village, and more. The new Evergreen Village that opened in June of 2018 is Bloomington’s first assisted living facility that accepts residents on Medicaid, providing housing and support to many low-income seniors. John believes in a housing-first approach to addressing homelessness. During his time as the board President of Shalom Center, he helped to open Crawford Apartments, which provides housing for persons experiencing chronic homelessness. During his administration, the city collaborated with Shalom Center and LIFEDesigns in opening Crawford II, adding 36 new apartments. How has Bloomington increased and retained good jobs during John’s tenure as Mayor? The city established a $15/hour minimum wage for City employees. The city rehabilitated and opened The Mill in the Trades District, a century-old furniture factory transformed into a vibrant coworking and incubator space for the new economy, immediately attracting 2 new tech companies and supporting 150 entrepreneurs. The new Regional Academic Health Center, our community’s largest-ever single project, is a $400 million investment partnership between IU and IU Health, retaining 2,700 jobs. Cook Group is investing $100 million into the shuttered GE plant and creating 500 new jobs. Catalent invested $1 billion into Bloomington’s economy, retaining 750 jobs, and soon announced a $125 million expansion to add 200 more jobs. We became the nation’s first CDFI Friendly City, assembling $14 million in new resources for small business jobs, affordable housing, and community facilities like day care centers or health clinics. The city is working to expand the downtown convention center, in collaboration with the County and downtown partners. Bloomington purchased 24 downtown acres at the current hospital site for community-led re-use, including new affordable housing units. How is John working to improve our quality of life in Bloomington? John is leading an unprecedented investment in parks and trails, from Switchyard Park to new trails and greenways all across the City (helping our Parks Department win national Gold-Medal recognition as the top department for cities our size). In 2018, we funded over seven miles of new trails at Griffy Lake, 7th Street, Cascades, and RCA Park. By doubling arts grants, sponsoring new murals all over town, and supporting new festivals and events like downtown fireworks, the Bicentennial Street Fair, and the Black y Brown Arts Festival, John and Bloomington earned a national award for arts leadership. A former school board member, John has been an avid supporter of public education, actively promoting two successful funding referendums and visiting many classrooms to connect children and local government. Bloomington expanded access to pre-K education across the city, with our first-ever city program funding pre-K in 2018 and 2019. Working together, the Parks and Recreation Department and Centerstone have established a groundbreaking summer jobs program helping hard-to-employ persons gain experience and find new jobs. The city has installed more than 400 ADA sidewalk ramps, purchased new electric vehicles, supported extended hours at Shalom’s day center for people experiencing homelessness, and helped finance solar panels for low-income homeowners. The administration’s ongoing commitments to inclusion and equity help Bloomington be the only Indiana city earning a 100% rating from the Human Rights Campaign for equity. In the face of climate change, what are we doing to ensure a sustainable future? In three years, Bloomington has quintupled its solar energy production at 27 city facilities, installing more than 6,500 solar panels, and by cooperating with SIREN to support home solar systems, made Bloomington a state leader in clean energy. The city and IU together brought the Pace bike share program to town, as well as regulating new scooter companies, that all deliver alternatives to automobile traffic. Bloomington is the only Indiana city to be named a Gold Level Bicycle Friendly Community by the League of American Bicyclists (one of only five named nationwide in 2018). John and his team aggressively stepped in to protect the water quality at Lake Monroe when it was at risk, and since then have collaborated with regional stakeholders to plan for the long-term quality of Lake Monroe and its watershed. The administration has funded the planting of 1,000’s of new trees and has dedicated millions of dollars for new green infrastructure like green roofs and rain gardens to improve resilience. We developed our first comprehensive sustainability plan for the community to benchmark and measure current status and implement improvements every year. At the 2019 State of the City Address, John announced a task force to explore the possibility of converting an existing wastewater plant to anaerobic digestion. This could allow conversion of some of the 40% of our waste stream that is compostable into energy (Compressed Natural Gas) to fuel local public vehicles such as busses, sanitation trucks, and snowplows. By linking energy, mobility, food, and infrastructure, Bloomington could achieve improved resilience and lower our carbon footprint. The task force will make a report within one year. What is happening with the annexation process? Bloomington has annexed dozens of times over our 200-year history, bringing newly urbanized areas into the city. This allows residents to receive appropriate levels of services like fire and police protection, sanitation, parks, sidewalks, housing regulations, and more. Bloomington basically stopped annexing from 2000 to 2015, despite continual growth, so annexation was long overdue. During that time, many property owners outside the city were provided city sewer services. John discussed the importance of annexation during the 2015 campaign, and in his inaugural address on Jan 1, 2016 indicated the need to consider this important issue. In 2017, Bloomington scrupulously began the very detailed, state-mandated process to annex territory, much of which was long intended for annexation. Annexation experts called it the most detailed and transparent annexation process they had ever seen in Indiana. This process costed about $750,000 in detailed financial and legal procedures. By state law, annexation proposals can only be shrunk, not expanded, so typically they begin with the largest possible annexation and proceed to reduce the size. The city administration shared the proposed annexation maps with everyone at the same time, in order to avoid certain groups having inside information about the process, and to begin the months-long public deliberation. Dozens of public meetings were held and hundreds of public comments were received as the process rolled out, leading to the proposed new boundaries being reviewed and adjusted based on public comment. Halfway through the detailed local process, the state legislature singled out Bloomington’s annexation and halted it with language amended into the state budget bill. This targeted legislation stopped annexation mid-way and prohibits any of the proposed land from being annexed for five years. This “special legislation” is illegal because it only affects one municipality. The city administration sued to protest the state’s action: to protect local autonomy from intrusive legislation by which the ultra-conservative state legislature singled out one progressive city--Bloomington. The lawsuit is being conducted by our very capable in-house city lawyers, therefore not costing any money for outside law firms. A decision at the trial court is expected in 2019. The Bloomington Police Department used an armored vehicle for a decade in the early 2000s to protect officers and the public in certain dangerous situations. The vehicle eventually became unusable from age, and a replacement vehicle was included in long-term capital plans for the department. We have a crisis in the United States with regards to gun violence. John realizes this and is a vocal supporter of common-sense gun control, but the state legislature prohibits cities in Indiana from regulating firearms. As a municipality, one area that we can control is how well-equipped and trained we are to handle a dangerous situation in which someone is using a firearm. In active shooter or hostage situations involving high-powered firearms, the existing police vehicles are not capable of getting close enough to the situation to perform rescue operations. In the past, the Bloomington Police Department has had to call upon the closest armored vehicle, which is property of the Morgan County Police Department in Martinsville. This means assistance can be long-delayed, and also that outside police departments can be responsible for rescue and response on our own community. The city administration concurred that the debate over the replacement of an armored vehicle began inappropriately, with Police Chief Diekhoff’s announcement of the plan at an annual public safety report in February 2018. Public debate should have begun earlier. Once the issue was engaged publicly, however, the city administration led a vigorously transparent and open public discussion about if and how to purchase an armored vehicle for rescue purposes and for protection of the public and first responders in emergencies, active shooter, hostage situations, or other dangerous circumstances. Numerous public meetings were held, where widely ranging public views were expressed. After two months of extensive debate and open conversation, the administration determined to proceed with the purchase, but adjusted the design of the vehicle and endorsed protocols for its use to reflect community interests and concerns. This included painting the vehicle a lighter color, clearly marking it as a “rescue” vehicle, and changing some other details (reducing number of gun ports, etc.). The City Council, with administration support, established guidelines for how the vehicle should be used--only defensively-- and set a system of checks and balances for its use. Reflecting public interest, Bloomington now has the most transparent and public utilization of an armored vehicle of any community in the state (and possibly the nation) with detailed public rules of engagement, monthly detailed public reporting on any deployment, and review of compliance with all relevant oversight rules and protocols. As of February 2019, the vehicle (known as the Critical Incident Response Team (CIRT) Rescue Vehicle) has been deployed 3 times in 8 months, each time responding to an armed hostage situation. Public reviews have been positive and note its consistent and appropriate use in accordance with policy. Why did the Bloomington Police Department invest in an armored rescue vehicle? The administration has actively sought to increase availability to high-speed broadband to all parts and residents of the city, in an open and net neutral system. Early in 2016 John created a broadband advisory group, and convened a gathering of national experts to consider how a city like Bloomington could advance digital access and fairness. The city issued a Request for Qualifications (RFQ) to identify interested potential partners in a collaborative investment to improve digital access and fairness in Bloomington. More than a dozen respondents brought plans forward, representing companies around the country and the globe. After interviews with several promising options, the advisory group identified the best options in late 2016. Axia Fiber, a Canadian company with experience in and commitment to a net-neutral and wholesale or infrastructure model of digital fiber, indicated their intent to invest in a new city-wide fiber network in Bloomington. After the 2016 national elections and changes in the Federal Communications Commission, and after analysis of the potential risks and returns on their private investment plans, Axia’s investment partners determined that the investment plan was no longer feasible, and pulled out of the deal. John and the city have been exploring additional options with several other potential investor companies, but the regulations put in place by the Trump administration and his Federal Communications Commission have made the market tougher for new companies and given larger, more established legacy companies an even greater advantage. While the investigations continue, it’s worth noting that in the face of the potential new competition from the city’s efforts, existing providers (Comcast, AT&T, and Smithville) have invested millions of dollars to upgrade services to existing and new customers. While some areas still have only one internet provider, the potential for broadband has pushed our existing providers to expand their networks and improve their services somewhat, so some residents are seeing better/more options. What is happening with the Broadband initiative? Why does Bloomington do a city wide survey and how does it work? John wanted to expand the ways we learn how residents think and feel about our city, so asked that a scientific city-wide survey be conducted periodically. The first survey, in 2017, revealed many interesting perceptions and views, and also established a baseline of likes, dislikes, opinions and desires in the community, shared in a publicly released report and analysis. The survey will be conducted every two years by a professional survey provider, to help identify trends, and also to benchmark Bloomington’s results against several hundred other U.S. cities. What is activity-based budgeting, why did the city start using it, and how does it work? Implemented beginning in 2017, activity-based budgeting outlines and organizes the entire city budget around key activities rather than budget categories like personnel, supplies or contracts. For example, the budget will identify what is invested in fire prevention, or in housing inspection, or in arts promotion, or in police patrols, and the affiliated total investment costs. With category-based budgets, we showed personnel costs, and equipment costs, service costs for a wide range of programs, without assigning them by activity. This activity-based budgeting is central to helping all of us identify the real investments and choices we make in the budget. It helps us "say what we'll do" as we're developing and reviewing budgets. As a new process, it's a work in progress. The goal is to add transparency, by aligning funding with activities and outcomes, listing dollars invested to achieve specific objectives, such as street miles paved, apartments inspected, emergency response times, or swim lessons delivered. The city works very hard to identify measurable goals and outcomes for each area of activity. All of this lets the public compare how much we're spending on various activities, to better ensure our values are reflected in our budget. Received Tree City USA designation for the 34th year in a row. Named the “greenest” city in the entire State of Indiana by the website “Insurify”. Received 2018 National Gold Medal Award for Excellence in Park and Recreation Management from the American Academy for Park and Recreation Administration (top department in the country for cities our size). Recognized as a 2017 Playful City USA community. Received the 2019 National Award for Local Arts Leadership from the US Conference of Mayors and Americans for the Arts. Bloomington received a Human Rights Campaign 100% score, again, 3 years in a row (only one in Indiana). Bloomington was named a top ten most friendly small city to LGBTQ persons in 2018. Named the first “CDFI Friendly City” in the country in 2018. Bloomington’s Police Department was given its first ever national accreditation, CALEA, in 2018. Improved Fire Department national safety rating to Level 2. Named 24th best city for entrepreneurs in 2017. Won the 2018 Best of Indiana Award for Best Application Serving the Public for 2017 website redesign. Bloomington City website named One of Nation’s Top Ten by for Digital Government, 2018. ITS Department ranked 10th in the 2017 Digital Cities Survey, 75,000-125,000 population category. Received Government Technology’s Best of Indiana Award for Best Application Servicing an Organization’s Business Needs for inRoads application. Selected as a MapBox City (one of three globally). John was born in Bloomington and attended two years of grade school here. After graduating from Harvard, he returned to Bloomington to attend Indiana University Maurer School of Law. He went on to have a distinguished career of public service, focused on increasing economic justice and opportunity, civil rights, and environmental stewardship. John has worked extensively as a public servant in Democratic government, leading two state agencies, advising a governor and lieutenant governor, and serving as an elected official. As the Secretary of the Indiana Family and Social Services Administration, he oversaw the implementation of Medicaid and welfare programs, services for the elderly, disabled, mentally ill, and children at risk, and statewide community development and housing programs – all executed by a staff of 10,000 Hoosiers with an annual budget of $6 billion. Earlier he served as Commissioner of the Indiana Department of Environmental Management, the agency tasked with the statewide protection of Indiana’s air, water and land. 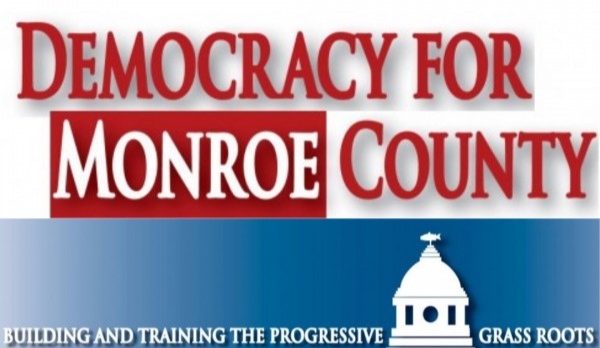 John served as an elected member of the Board of Trustees for the Monroe County Community School Corporation. Throughout his time in Bloomington, John has served on many state and local commissions and boards, including chairing the Bloomington Commission on Sustainability and the Shalom Community Center board, as well as national boards such as the National Community Land Trust Network. John moved to Washington DC for five years in the 1990s, where he put his progressive values into direct action by founding a family of organizations to increase economic equality and reduce the legacies of discrimination in our nation’s capital. Over the past 25 years, City First Bank and its affiliates have provided more than $1 billion of assistance, supporting thousands of jobs, thousands of affordable housing units, and dozens of vital community facilities like health clinics, arts centers, and food pantries, all focused on strengthening low-wealth communities. John served as founder and a director of the bank, and President of City First Enterprises, an affiliated nonprofit loan fund and public advocacy organization, and City First Homes, a city-wide community land trust. John and his wife Dawn Johnsen met in Chicago after law school. A graduate of Yale College and Yale Law School, Dawn later worked in New York City and Washington DC for 11 years until they together moved to Bloomington in 1998 to make their home and raise their family. While John did his state government and community development work, Dawn joined the faculty at the Indiana University Maurer School of Law, where she teaches constitutional law, executive power, and women’s rights, and continues her national advocacy on progressive issues. Prior to her teaching career, Dawn worked at the ACLU, helped lead NARAL Pro Choice America, and served in the Clinton Administration with Janet Reno at the US Department of Justice, where Dawn led the Office of Legal Counsel (OLC) in the late 1990s. Dawn also served on Presidential Transition teams for Presidents Clinton and Obama. President Obama nominated her to serve again as head of OLC in 2009, but the Senate failed to provide her a confirmation vote. 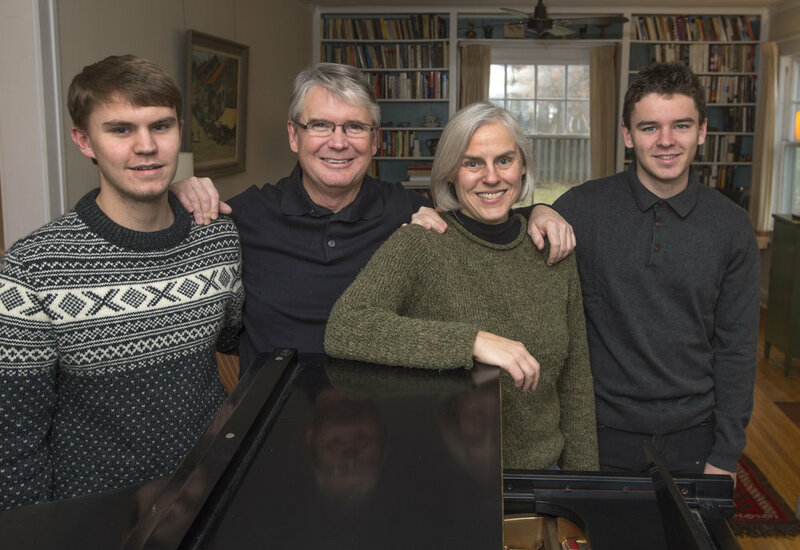 Dawn and John have two sons who graduated from the Bloomington public school system. Matthew recently graduated from Yale, and Eric is a sophomore at Williams College. John has received Sagamores of the Wabash from two governors of Indiana. His work has been nationally recognized, receiving a National Innovations Award from the Council of State Governments, a Silver Hammer Award from the National Performance Review, support from the Social Innovation Fund of the White House, and a Distinguished Service Award from the Indiana University Maurer School of Law. John has also taught as Adjunct Faculty at Indiana University’s School of Public and Environmental Affairs, teaching high-performance government and administrative law. John enjoys music -- singing and playing piano -- reading, hiking, tennis and walking with Dawn anywhere. He has been serving as Bloomington mayor since January 1, 2016.